Although robots are finding their place in our society as artificial pets, entertainers, and tools for therapists, current technologies are expensive and have yet to enable the range of emotional and social capabilities necessary for rich and robust interaction with human beings. At the University of Denver, we have prototyped an extremely low-cost and portable robotic head using animation-projection and a custom designed facial mask that can display the rich emotive facial gestures and visual speech generated by an avatar agent. 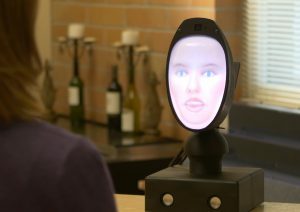 The agent can speak and produce and mirror facial expressions synchronized with agent’s visual and prosodic speech. This CompanionBot (aka Ryan) can impact the social robotic market significantly since there is no such animation-projection human robotic avatar available commercially that can be acquired; 2) it is extremely cost effective (about $5K) and customizable (avatar’s age, gender, ethnicity, etc). We foresee our Social Robot to be used in classrooms as science tutor, companionbots in nursing homes, museums tour guide, hotels receptionists, and tourist information kiosks. The Ryan Companionbot is going to be commercialized by Dreamface Technologies.